The model 222 designed to measure pressure conditions within combustion plant can also be used to control air flow for optimum combustion efficiency using the solid state relay output control options (a.c.and d.c.control options available). Specifically designed for boiler, incinerator and furnace applications, equally suitable for any inert gas heating and ventilating applications, or energy management systems. Housed in a weatherproof aluminium enclosure to IP 65, the Model 222 incorporates a robust stainless steel variable capacitance sensor with quality solid state circuits providing accuracy and stability. 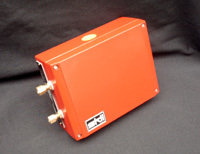 The unit complies with current EMC and LVD standards.